Grow Land, LLC is one of the premier landscape, Bocce Court, irrigation, and outdoor lighting companies in the Greater Phoenix Area. See our Videos Here: <a rel="nofollow" target="_blank" href="http://growlandllc.com/videos">http://growlandllc.com/videos</a> Our personalized services include full landscape consulting, irrigation and landscape installation and remodeling (including hardscape elements), and repair services. Our experienced landscape and irrigation staff guarantee unprecedented customer service and complete client satisfaction. Call today for a free estimate! (602) 689-2947. We are here to help. We are a top builder of Bocce Courts in Arizona. Design | Build | Lighting | Maintenance | Repair | Premium Surface | All the other good stuff... Please see our dedicated website at <a rel="nofollow" target="_blank" href="http://growlandboccedesigns.com/">http://growlandboccedesigns.com/</a> The Grow Land, LLC concept was the brainchild of Greg Rowland. Although Greg has been an expert in the landscape industry for over 25 years, the Grow Land company launched officially in the Summer of 2010, and Greg has been adding to his network of clients ever since. A graduate of Arizona State University with a degree in Economics and an emphasis in Accounting, Greg has a wealth of knowledge and experience in bringing out the most efficient use of water to both make plants look great AND save water at the same time. Greg has also worked heavily in the home-building and land development fields, so you can count on him to understand what the others don’t. Grow Land, LLC has a breadth of resource professionals, so no job is too big or too small. We provide personal, honest and one-of-a-kind service, and treat your landscape like it was our own. Greg was born and raised in the farmlands of Missouri, and brings that kind of Midwestern courtesy and respect to your doorstep. He currently resides with his wife and daughter in the downtown Scottsdale area. Grow Land, LLC is K-21 licensed (AZ ROC 268417) with the State of Arizona. Grow Land, LLC is insured and bonded for your protection, safety and peace of mind. Arcadia's Preferred Creative Landscape & Design Professional! 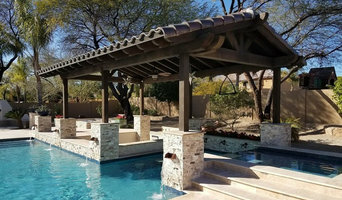 Since 1950, Creative Environments has been building customized outdoor spaces for the homes of Gilbert, Phoenix, Scottsdale, Tempe and the surrounding areas. We provide stunning, award winning pool, spa, and landscape design and construction services. We are proud to be one of the largest and most highly regarded pool and landscape companies serving Arizona with innovative and creative outdoor spaces. Creative Environments has consistently remained a leader in the field winning both local and national awards as well as being named the #1 Landscape Designer in Phoenix by metro area residents. All of our projects are customized to suit the needs and preferences of each client. We take pride in crafting unique designs that are successfully implemented by our experienced and professional team. We can help you to create the outdoor living space of your dreams by planning, designing, and constructing from the ground up. 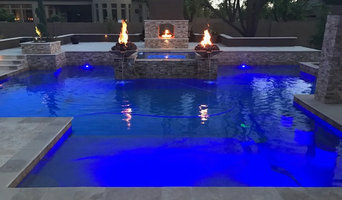 We specialize in custom pools and spas, outdoor kitchens, ramadas/gazebos, outdoor fire features, and more, much more. Let us help you conceptualize and implement the custom outdoor living space and custom pool and landscape design you have always wanted. Even though we specialize in unique customized designs, our number one focus is on customer service. We aim to meet and exceed your expectations for your home by offering diligent service with the attention to detail your project deserves. Our experienced team will put over 50 years of experience to work for your home. We look forward to providing you with the beautiful landscape design you have always wanted. Contact us by calling (480) 777-9305 today. Phoenix's Full Service Landscape Designer - Best of Houzz 2019! SBD-studio gathers the combined talents of a team of professionals committed to bringing a deeper awareness to the acts of making and of re-formulating environments. We are landscape architects and planners conforming to the challenges of this Century and firmly rooted in the ethic of stewardship and the pursuit of life giving forms that can bring us closer to a renewed attitude towards the natural environment. In our efforts we promote the idea of collaboration with various disciplines to achieve positive acts of transformation at many levels. We study information, develop strategies and subscribe to models which inform outcomes crafted, organized and integrated to the natural systems. As a group, we possess a spirit of discovery, and look for instances to bridging science, art and nature in our creations.